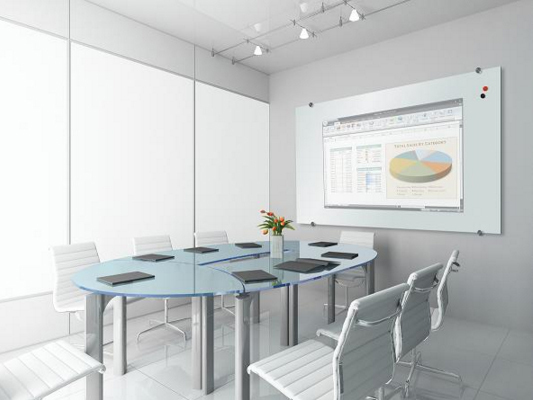 Glass Dry Erase Boards are a wise choice for schools and office spaces for several reasons, but let’s be clear – many of our clients choose them because they are visually appealing. In a public space, for example, a medical office reception area where patients can often see much of the “behind the scenes” office space, glass dry erase boards look clean, sharp, and modern. For the employees using the boards, there’s a very practical bonus: the board’s thick frosted white glass is the ideal surface for wet or dry erase markers. It remains clean and easy to read for years because the glass will not stain or ghost. Stay on top of your busy schedule with the Black Magnetic Glass Dry Erase Monthly Calendar and Weekly Planner from Best-Rite. It is an excellent time management tool for the classroom or office in modern and stylish magnetic black glass dry erase surface. 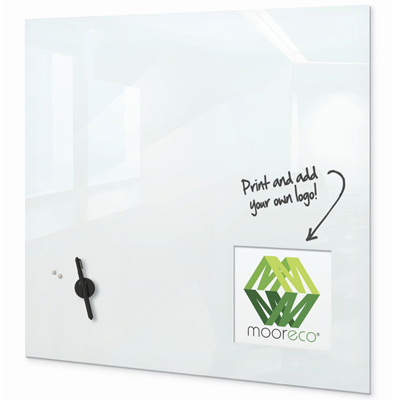 Make it your own and customize a glass dry erase board with your logo or any other design. The Customizable Magnetic Glass Dry Erase Board by Best-Rite features an insert for removable graphics. Keyhole brackets allow mounting with no visible hardware, adding a sleek and modern look to any office space. Most of our glass dry erase boards can also be customized to match any color and virtually any image as the background of the board. Call us for a quote for more information on custom screen printing. While many offices choose glass dry erase boards for their clean and professional appearance, employees certainly appreciate the fact that they’re easy to read. Available in either glossy or projection glass, the surface and coloration are engineered to have ideal optical qualities. In particular, the Visionary™ projection glass surfaces exhibit good depth of field, good contrast and ambient light toleration. Translation? It’s easy on the eyes, which makes it more likely your message will be received! While they look good enough to impress (and perform well for a long time), glass dry erase boards are surprisingly inexpensive. Take a look at our prices and available board sizes, and contact us with any questions you may have about whether glass dry erase boards are right for you. Great blogs, lovely furniture’s, thanks for the info.